Microlab announces an important wideband addition to its already wide range of $ Saver Power Splitters/Dividers. 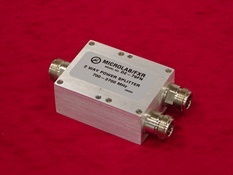 The new low cost, 2 way GPS Power Divider, D2-79FN, limits DC connection to one output port, and also covers from 698 to 2,700 MHz to include both the LTE-700 and LTE-2600 bands. Microlab Model D2-79FN of Wilkinson style Power Dividers has been designed for low power applications where output isolation is preferable over lowest possible loss. The wide frequency range of this design allows use with multi-band antennas and leaky cable systems. Similar GPS units with a DC path to a single output are available in 3, 4, 6 & 8 way configurations. These Power Dividers are available for immediate delivery from Microlab and selected distributors.